I asked him what kind of odd jobs he took in the off season to supplement his baseball salary. "Any job I could get." 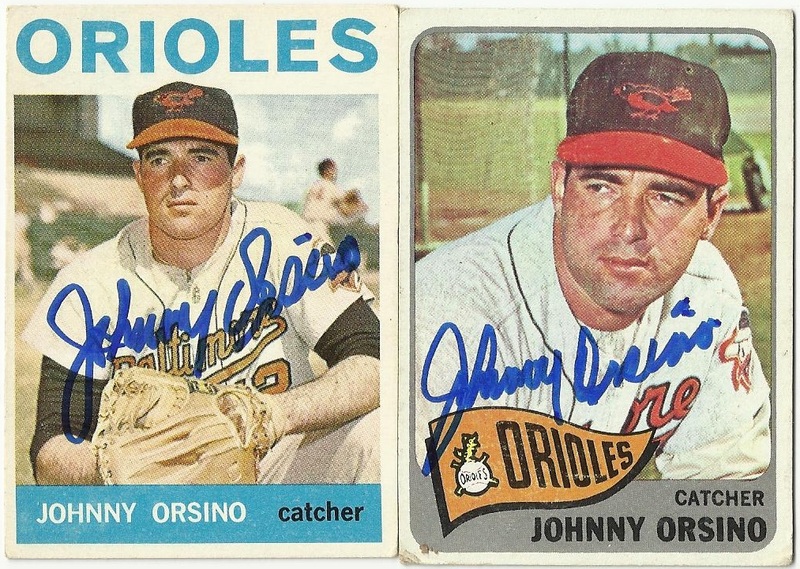 Johnny Orsino took a while to sign this 1964 and 1965 Topps, and an index card. John took 449 days. I was beginning to wonder if these had gotten lost since he normally takes about 30 days to respond and his success rate is 62%. 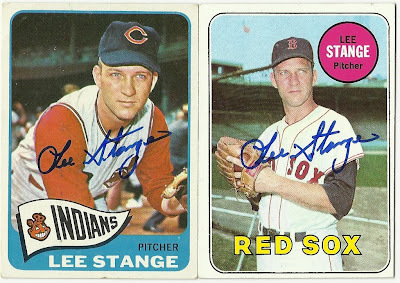 I sent these 1965 and 1969 Topps to Lee Stange the same day I sent to Bud Staley, Lee taking 7 days to return them with a signed index card. Lee is near perfect with a 98% success rate sent to his home in Florida. 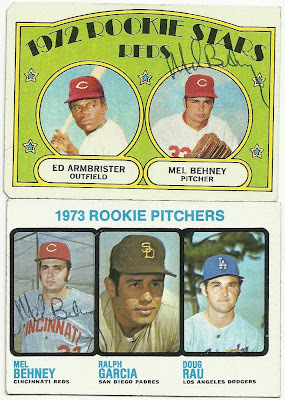 I think that the 1972 Topps rookie cards are my favorites, especially the two-person design. 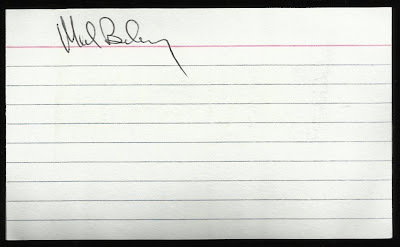 Mel Behney ballpointed these, and the index card, in 10 days. Mel is a perfect 27/27 on SCN, so if you got any cards for him to sign, and I think this 1972 and 1973 Topps are his only cards, you stand a great chance of getting them back. 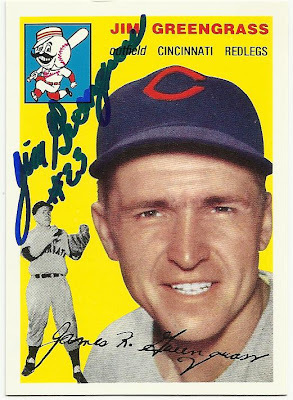 Quick return on this Topps 1952 Archives card signed by Jim Greengrass. Jim signed this in 10 days, personalized the index card, and answered some questions. He was in the military in 1946-1947 and served in Special Services on the baseball team at Camp Lee in Virginia, and in Recreational Programs at Fort McPherson in Georgia. I can't think of a better way to serve in the military. I won the 5-part March Contest at Play at the Plate. All we had to do was answer 5 easy questions about ourselves and our interest/likes. The drawing came down to 5 entrants, and I came out the randomized winner! I don't win much so this was a really nice treat. 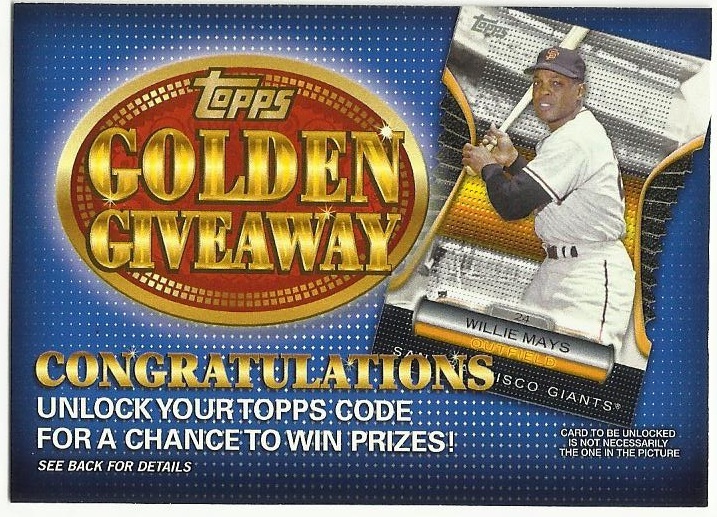 The prize was a hanging box of 2012 Topps. Sweet! Let's see what inserts and Angels I got. Not bad. But every time I see Mark Teixeira I cringe. 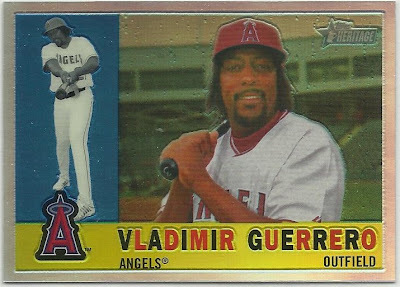 I didn't like it when he left the Rangers, and I didn't like it when he left the Braves, and I didn't like it when he left the Angels, and I especially didn't like it when he went to the Yankees! And now I just don't like him anymore. 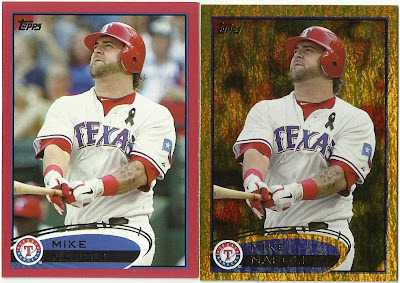 Hamerin' Hank is always a good thing, and I really like the 1987 Minis and the Gold Futures inserts. I went straightaway to insert my code and got another coin - the Oakland A's. That gave me three coins in my collection so I got a special code. And what did I get? Another coin. Jackie Robinson. 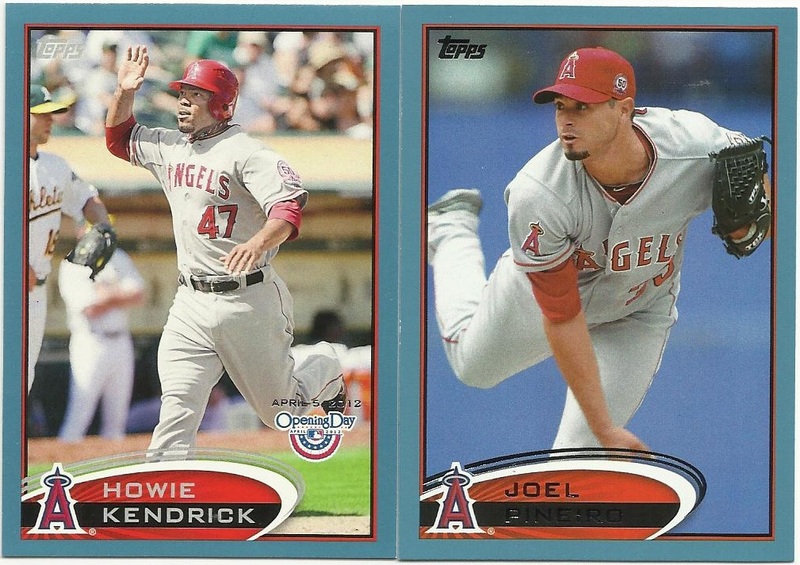 Also in the box were 3 Angels cards. I got a noce Mark Trumbo for the collection and I needed the Scott Downs for the set. Very nice. 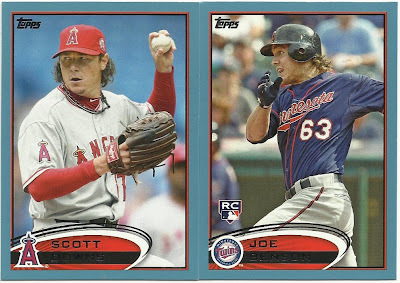 My two blue Walmart cards netted me another Angel, Scott Downs again, nice. These next cards were a bonus that Brian threw in for my Angels collection. All great cards that I didn't already have. Thanks for the contest Brian, and thanks for the extras. I appreciate it. Height: 6' 2", Weight: 205 lb. 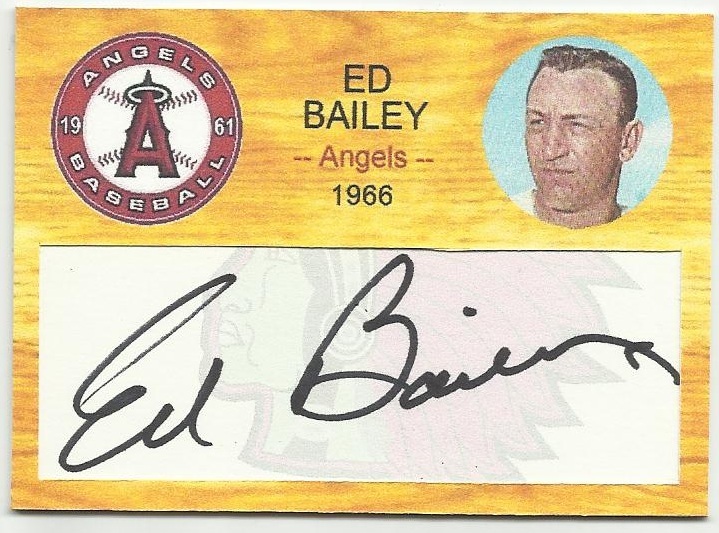 January 15, 1966: Purchased by the California Angels from the Chicago Cubs. May 7, 1966: Released by the California Angels. In the top of the 14th of a 2-2 tie, Bailey came in as a pinch hitter for Ed Sukla and made it as far as the batters box before being replaced by Frank Malzone (who struck out to end the inning). 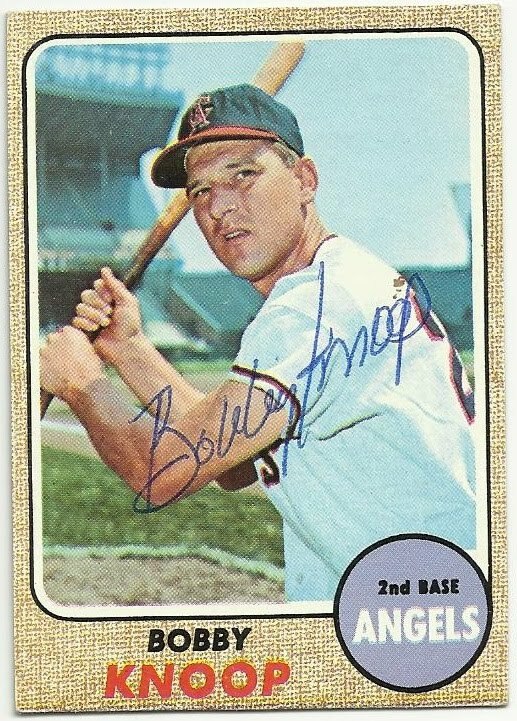 The Angels lost 3-2 in the bottom of the 14th to the Chicago White Sox on Tuesday, April 12, 1966 (D) at Comiskey Park I. 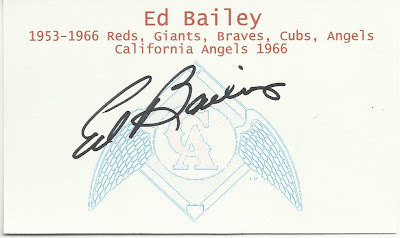 And that was Ed Bailey's Angels debut. 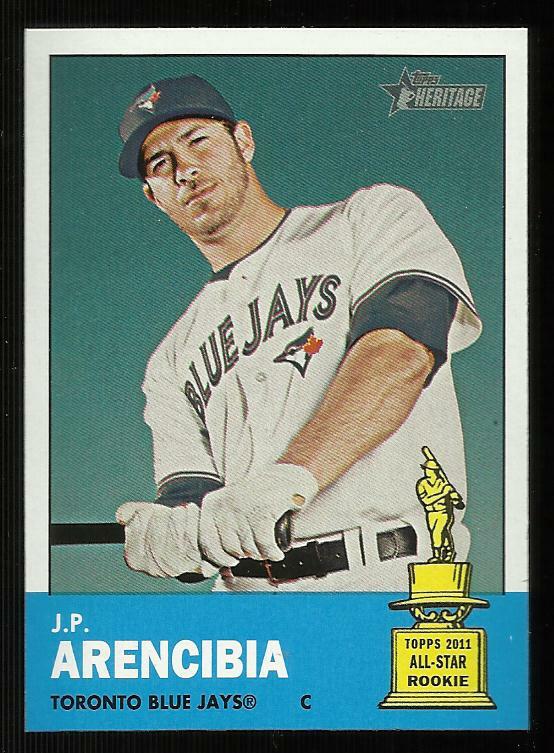 Appeared in 5 games and in 4 plate appearances never got a hit but walked once. Originally signed by the Cincinnati Reds as an amateur free agent before the 1950 season. Served in the military in 1952-1953. 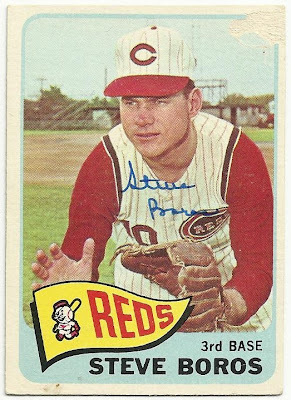 Also played for the Reds (53-61); Giants (61-63, 65); Braves (64); Cubs (65). Brother of pitcher Jim Bailey who were teammates on the 1959 Reds. 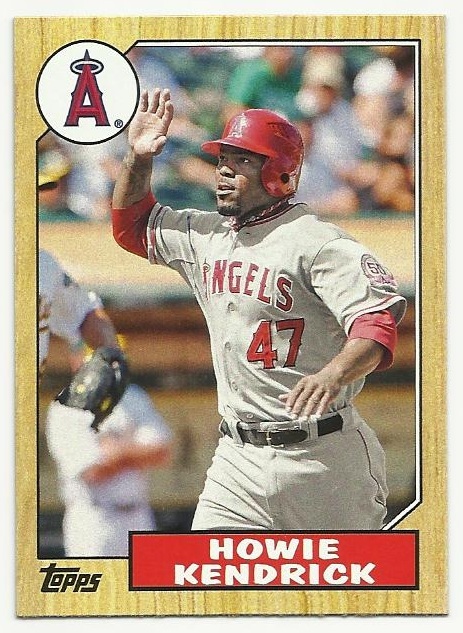 Hit double figures in home runs in eight of his 14 ML seasons. 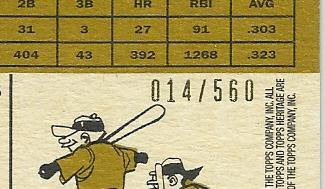 Hit three home runs in one 1956 game. Had eight pinch-hit homers, including two grand slams. Hit a two-run homer in Game 3 of the 1962 World Series. 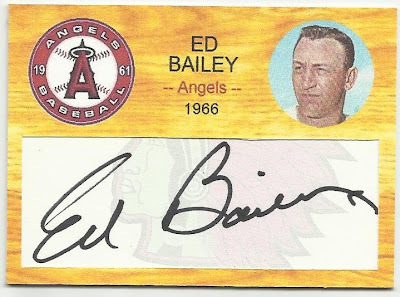 Collected eight RBI in a 1965 game. Made two unassisted double plays in 1963 and 1965. Caught Juan Marichal's no-hitter on June 15, 1963. 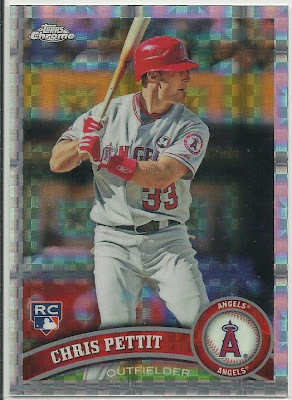 The first thing I do when I get a refractor, is to try to get it to refract - you know, hold it just right to get the rainbow effect. I'm still trying to figure out the best way to scan refractors to demontrate the best refractorization. 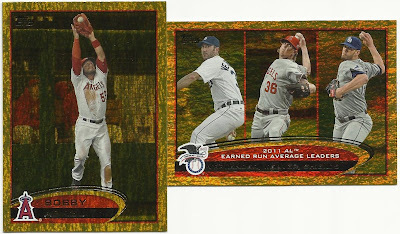 I have found that scanning them in a penny sleeve seems to work a little better. Holy smokes! Number 14!? 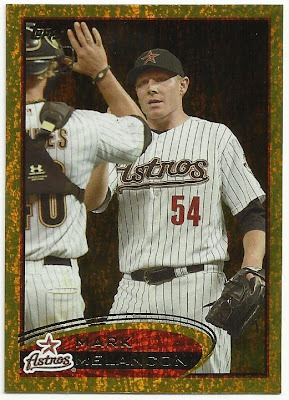 I think this is now the lowest numbered card in my collection. Sweet! 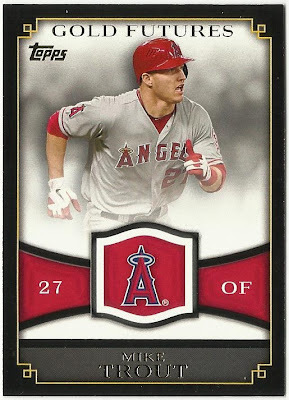 Ah yes, my mission in life: to acquire all of everybody's Angels cards. Troll knew this, recognized that resistance was futile, caved in and sent me all his remaining Angels. I never even had to ask. Thanks Troll. 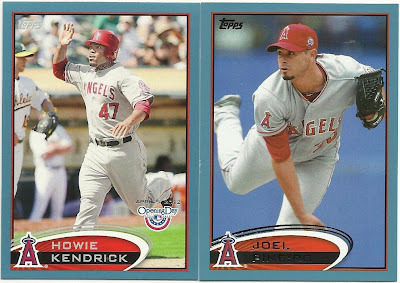 These three cards in the stack completed my 2011 Topps Update Angels team set. It's always such a thrilling feeling to complete a team set. 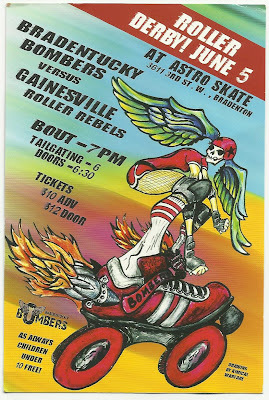 Oh, and don't forget to support the Bradentucky Bombers! Robert saw my post about my John Olerud collection and took it upon himself to send a heap of John Olerud cards. Lot's of shiney foily going on in there. 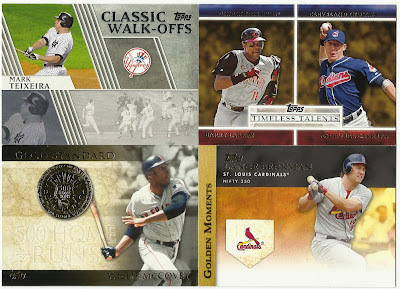 What a beautiful assortment of cards, so many different designs. 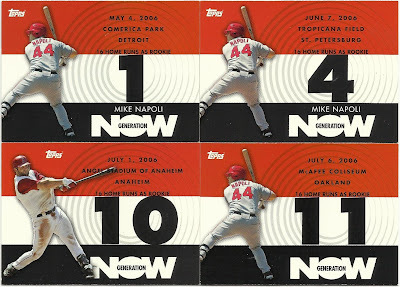 Two new Trouts and some new Mike Napolis from the specific sets I'm working on. GN104, GN105, GN107, GN108, GN109, GN110, GN111, GN114, GN115. 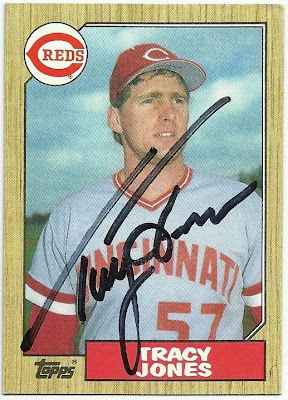 Doig Jones was a Major League pitcher for 7 different teams over 16 seasons. 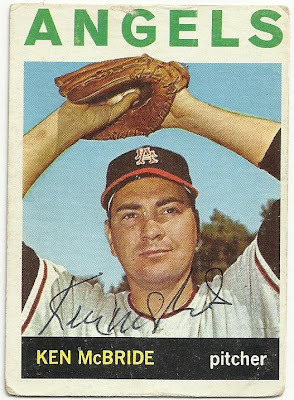 His career record was 69 wins to 79 losses, 303 Saves and an ERA of 3.30. Jones was a 5-time All-Star (1988-1990, 1992 & 1994) and was the NL Reliever of the Year Award Winner in 1992. "Humble yourselves under the mighty hand of God and He will exult you in due time, casting all your cares on Him, for He cares for you." 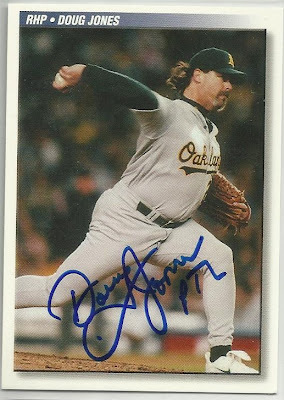 Doug Jones is a really good TTM signer with an 88% success rate. 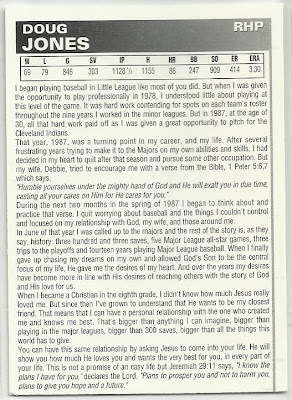 I sent him 3 set cards (1989 Upper Deck, 1991 Upper Deck, and a 1992 Stadium Club) which he signed and included 2 of these Bible cards as well. Doug added PTL (Praise The Lord) to his signature. 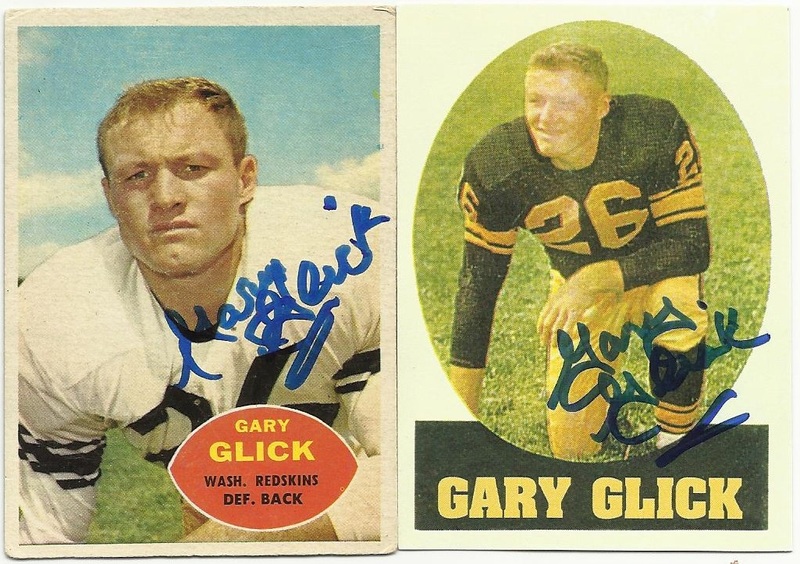 He signed these cards in 73 days from his home in Covina, CA. Newer Angel Jeremy Moore signed my 2012 Topps in 30 days from the Angels Spring Training camp in Tempe. 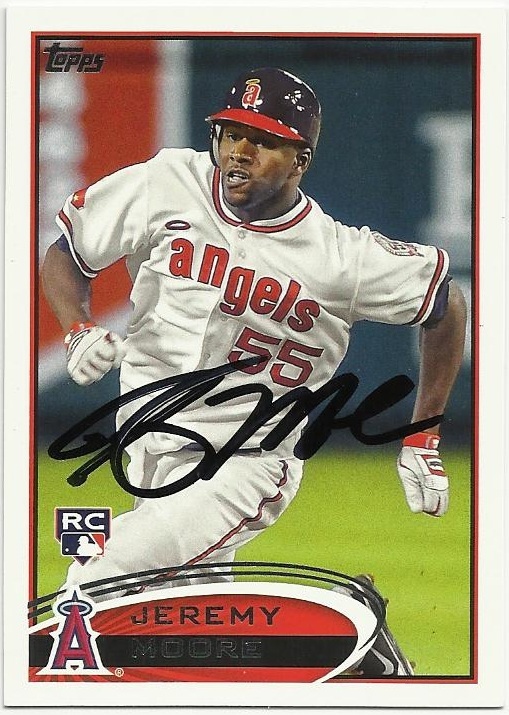 Jeremy appeared in 8 games at the end of his rookie season last year and hit .125 in 8 at bats. If you look closely at this Orlando Hudson you can see signs that it was, at one time, submerged in water. A neighbor kid knocked on my door the other night and handed me a soaking wet envelope. And I mean SOAKING WET. I thought there was no hope in salvaging it. Apparently it fell out of the mailbox when my wife got the mail around noon, and she never noticed it lying in the water-filled gutter. After it dried out, it's not as bad as I thought. I'll throw it in the 2006 Tradition binder for the set I'm working. No one will know the difference. 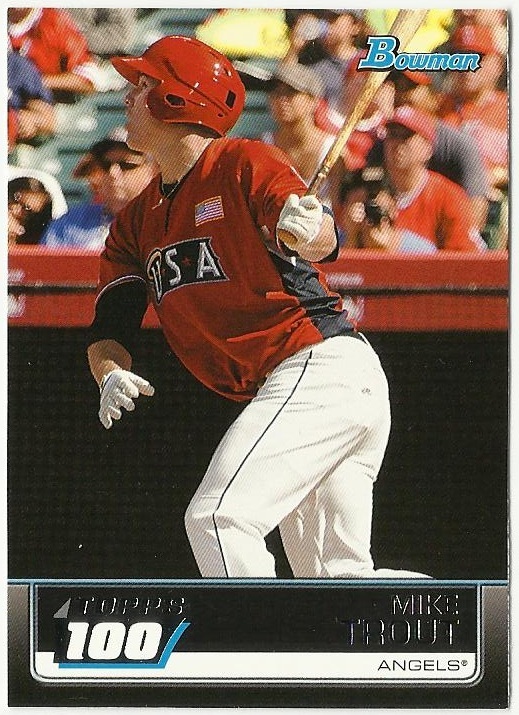 Signed in 12 days from the Padres Spring Training. Cheap on ebay a while ago. I don't know who Wendi is but I don't care either. It's a Jimmie Reese autograph! You don't get any better in Angels lore than Jimmie Reese. 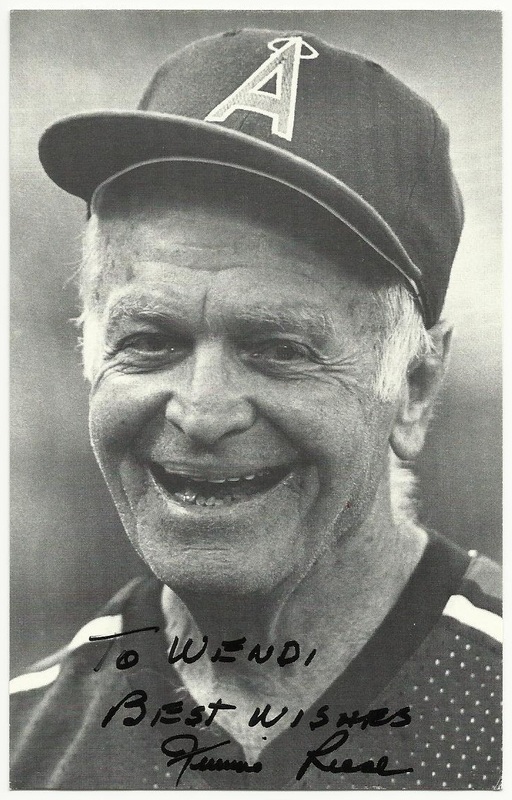 From 1972 until his death in 1994 Jimmie was a conditioning coach for the Angels. He was often seen during BP hitting fungos. His number 50 was retired by the Angels. 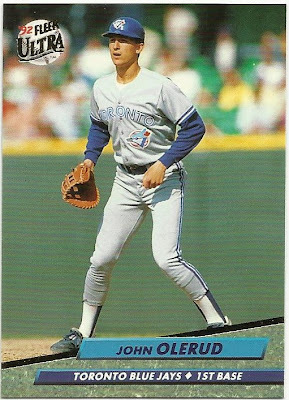 Looks like this postcard was a team issue in 1986. 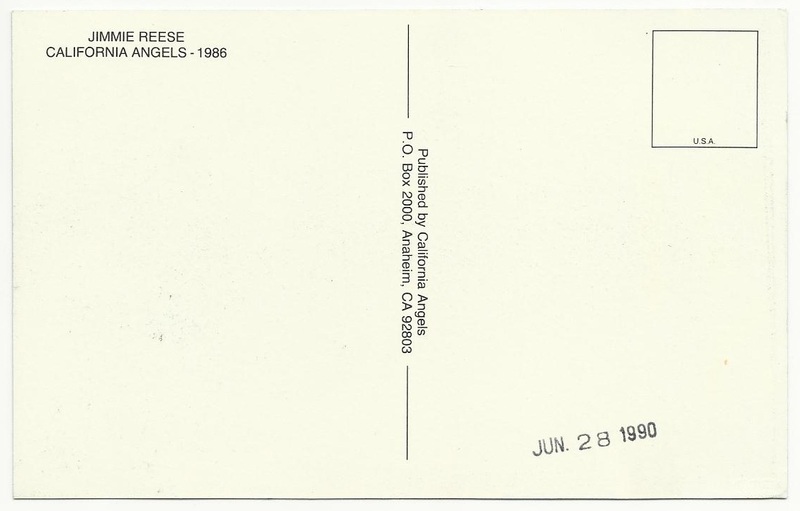 I'm not sure why the back was stamped JUN 28 1990. 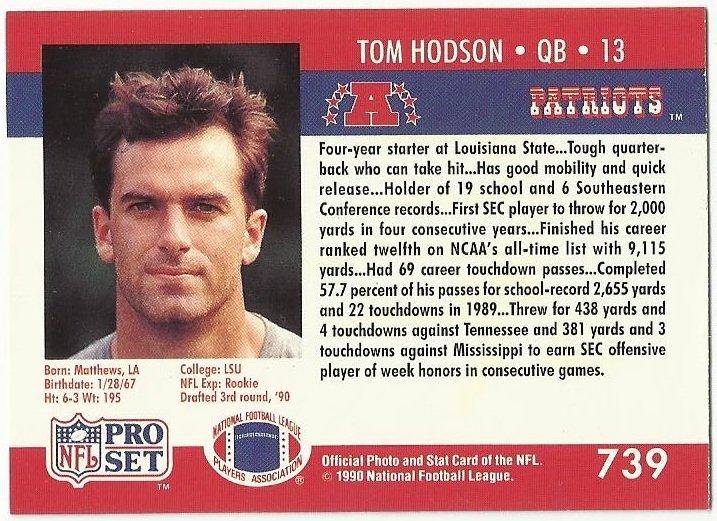 Tommy Hodson was selected 59th overall in the 1990 NFL Draft by the New England Patriots out of LSU where he had set all kinds of records and led the team to two SEC Championships. He also became the first quarterback in SEC history to surpass 8,000 career passing yards, and the first to surpass 60 career passing touchdowns. 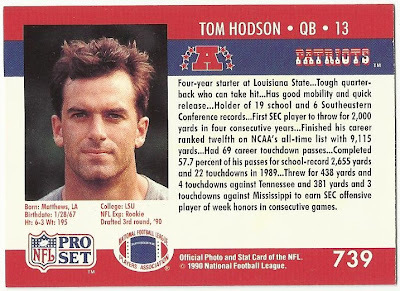 Hodson passed for over 2,000 yards during each of his four seasons at LSU, becoming the 3rd player in NCAA history to achieve that feat. 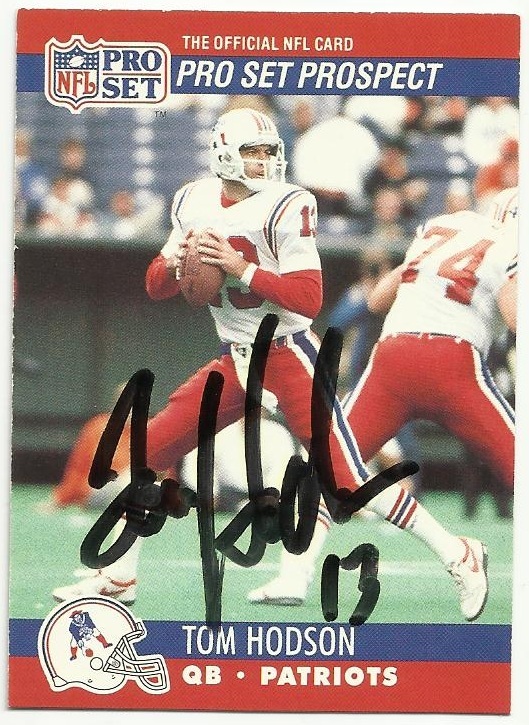 He finally started for the Patriots the last 6 games of his rookie season where he passed for 968 yards, but after that something happened that relegated him to a back-up role with the Miami Dolphins, the Dallas Cowboys, and the New Orleans Saints from 1991 - 1996 where he scarcely took a snap. 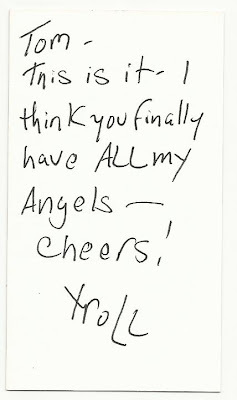 Tommy signed this card sent through the mail to his home sometime around 2005. 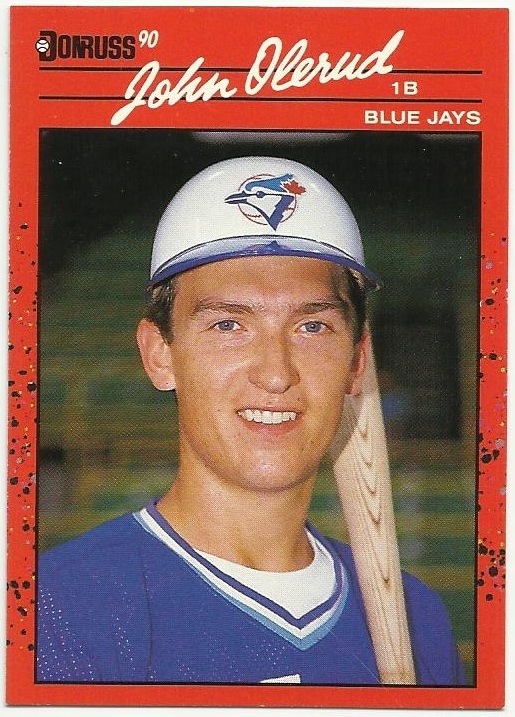 The only non-Angel I collect is John Olerud. 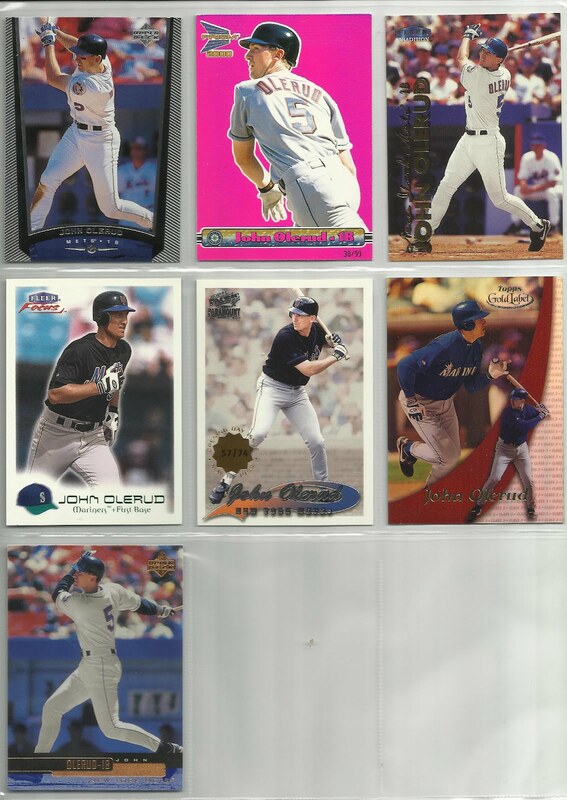 I followed John closely in the 90's and went to see him many times at Anaheim or in Arlington. I clipped newspaper articles on him and picked up his cards. I figured it was time to start displaying his cards in my collection. 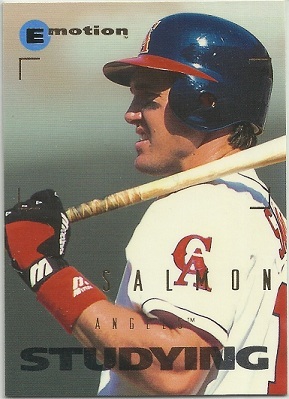 Unfortunatly I never got into any relic cards of his because whenever I had the dough to spend I would instead go for Angels relics especially those of Tim Salmon. So if theres any traders out there ready to part with John Olerud, let me know. 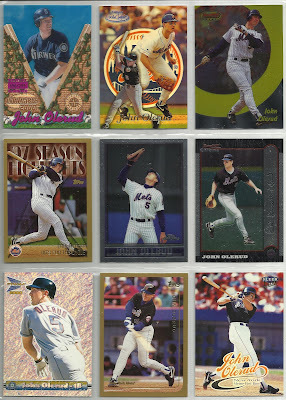 My Olerud binder is in semi-chronological order, so here's the first five cards I came to. #1 1991 Topps Toys "R" Us Rookies #24. 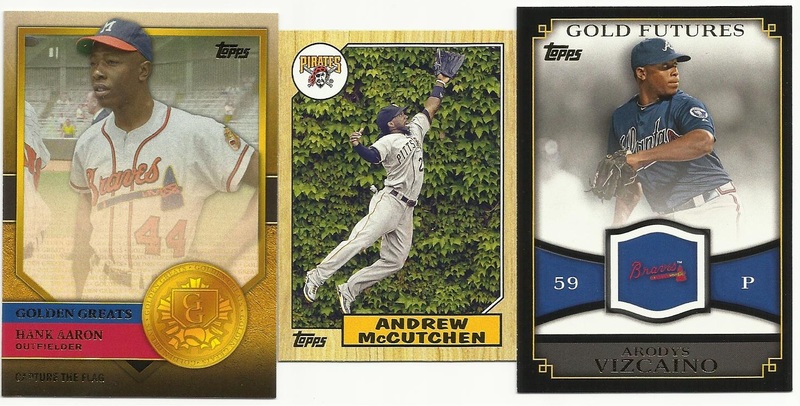 Some of my favorite sets of cards are the Toys "R" Us Rookies box sets. This one doesn't disappoint. John was born in Bellevue, Washington on August 5, 1968. #2 1992 Fleer Ultra #151. Nice shot of John at first base wearing his trademark helmet in the field. 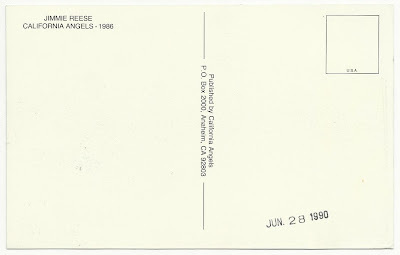 Johns birthplace changed on the back this card to Seattle, Washington. Hmmmm. #3 1990 Score #589. I love those early 90's Jays uniforms. He had a remarkable college career at Washington State as a pitcher and first baseman. 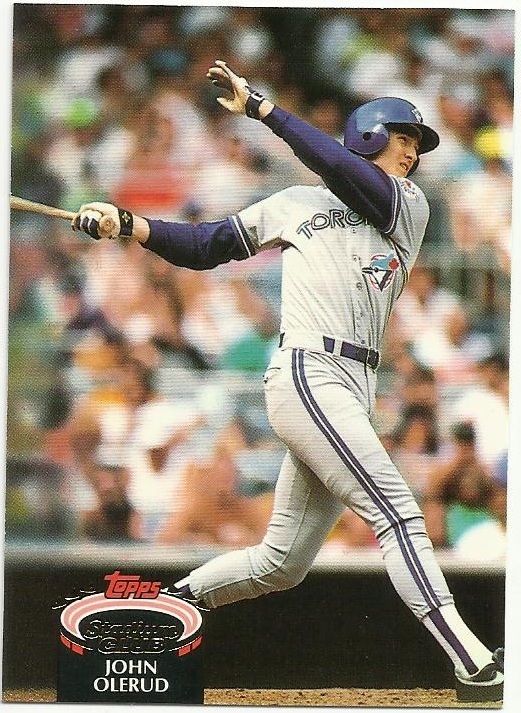 #4 1992 Topps Stadium Club #531. 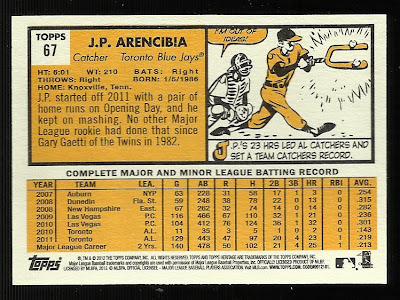 As a lefty against left-handed pitchers John hit .750 on balls low and outside. 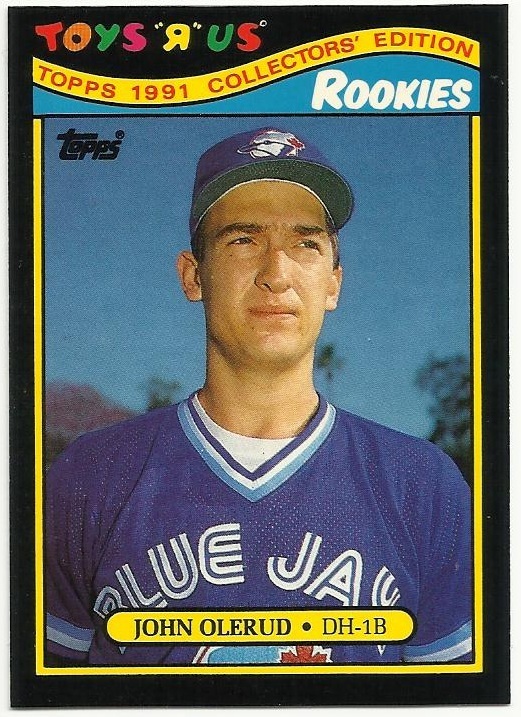 #5 1990 Donruss #711. One of my least favorite card designs. John has worn the helmet in the field since undergoing surgery for an aneurism near his brain in 1989. 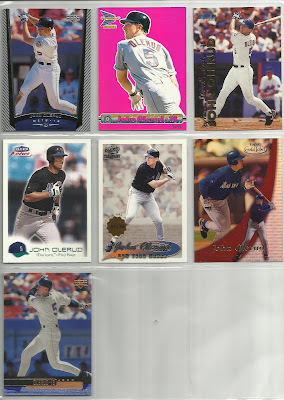 There you have it, the first 5 cards in my John Olerud binder. 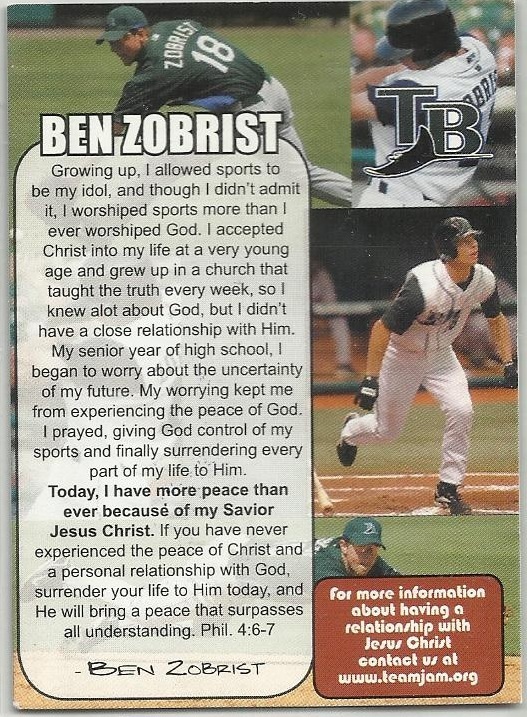 Ben was signing cards at Arlington Stadium when the Rays were in town to play the Rangers a couple years ago and I asked him if he had any testimonial cards on him. He whipped this one out, signed it, and handed it to me. 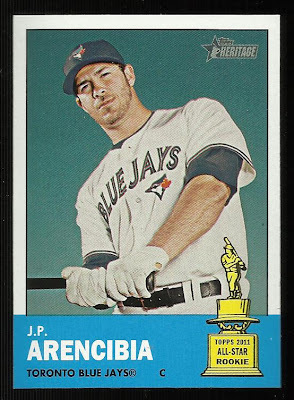 Did I Just Find A Heritage Error? Or has this already been noted somewhere? I couldn't find a reference to it on the net. 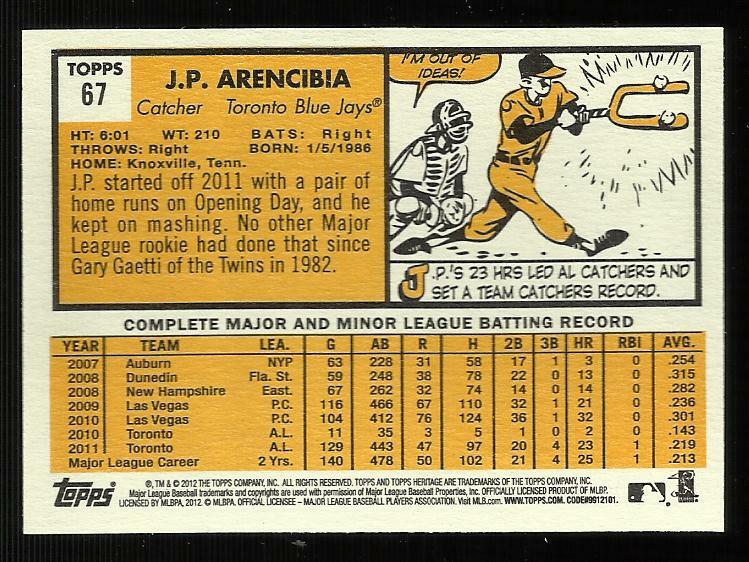 This is J.P Arencibias 2012 Topps Heritage card #67. 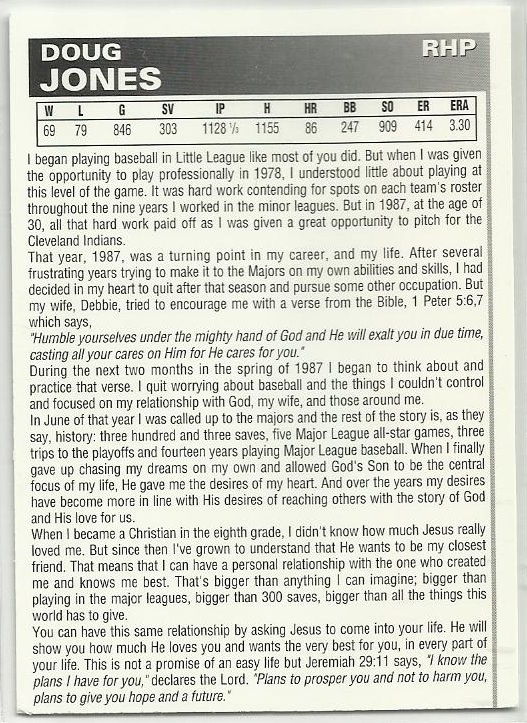 Here's the back, look closely at the RBI column. I don't think you can have that many home runs and only 1 RBI. 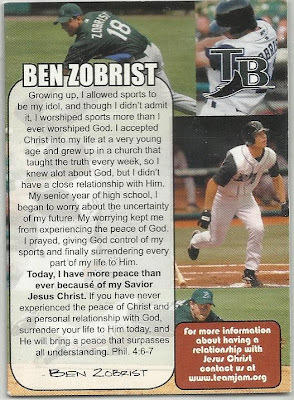 The last line is Major League Career totals. Please let me know if this is already out there. 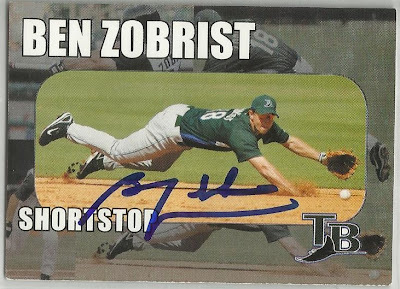 It's been a while since I posted my TTM autographs, and I've gotten a few since my last post. Cam Bedrosian signed this 2011 Topps Debut in 18 days from the Angels Spring Training. Cam is coming back from Tommy John surgery. I wish him well. 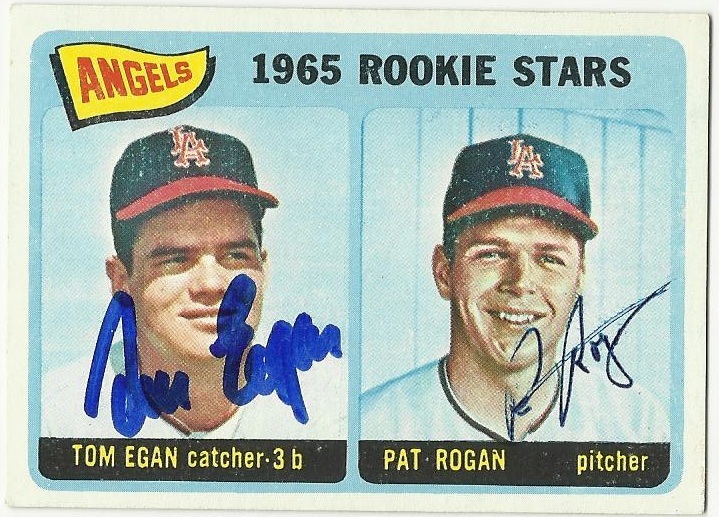 I recently found a successful address for Pat Rogan on SCN so I quickly sent this 1965 Topps already signed by Tom Egan. 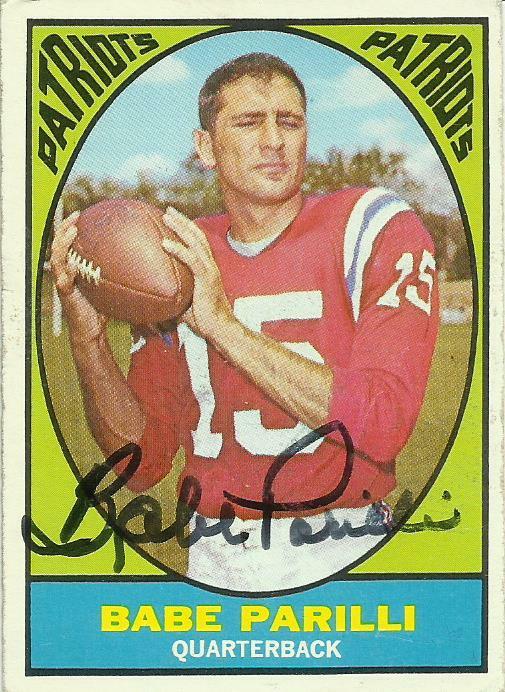 Pat returned it and a signed custom index card in 9 days from his home in Reno. 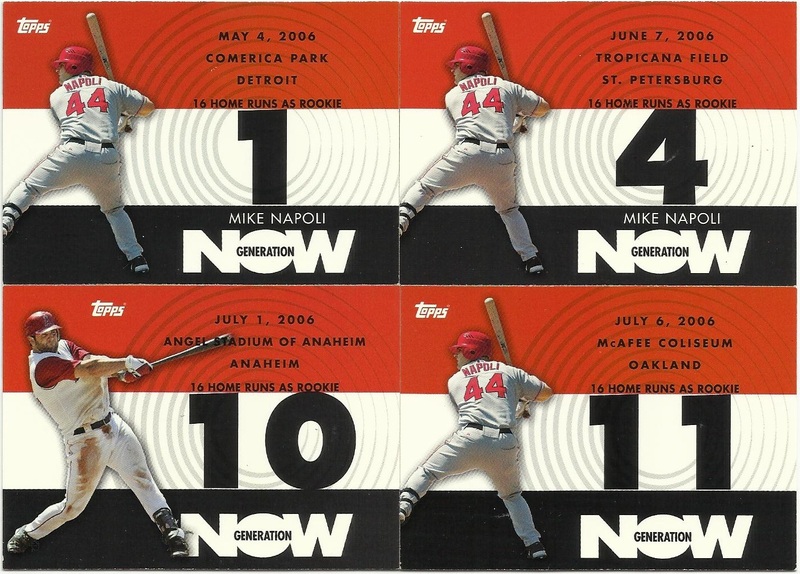 A very nice SCN member, Rick, sent this Ryan Shealy 2006 Fleer Tradition card for nothing in return. 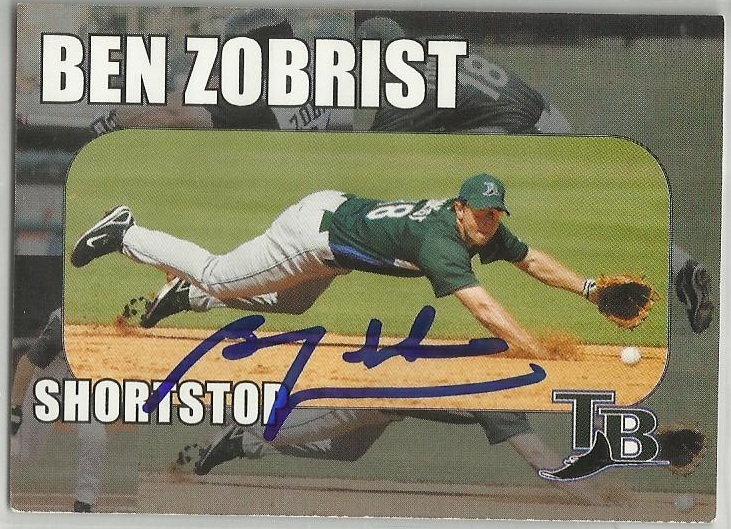 I needed this signed card for the set. Some pretty nice guys on SCN. Two cards signed by Rich Gale, a 1982 Topps and a 1983. 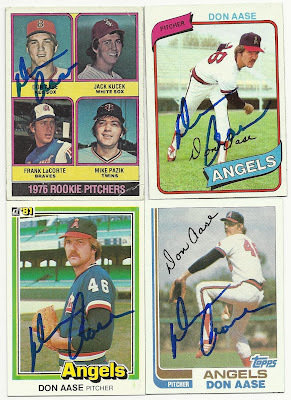 The 1983 is another autographed set I'm working on. 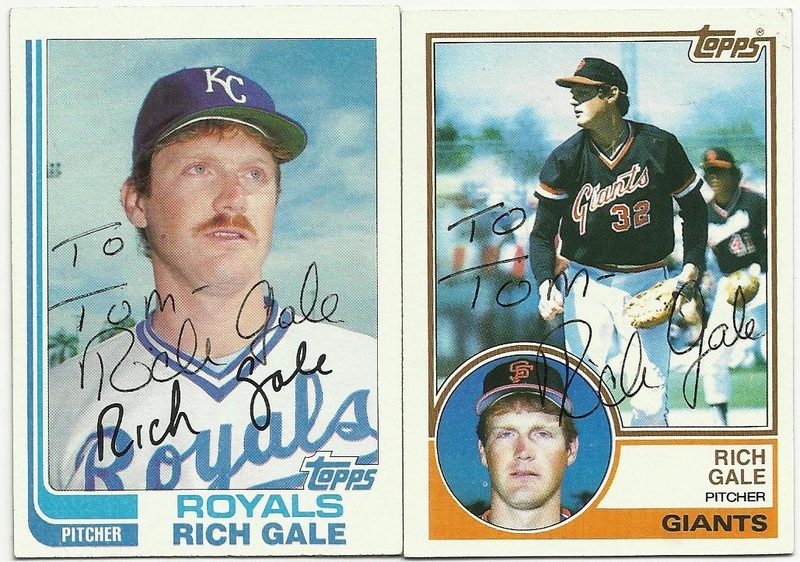 Rich signed these in 1,389 days sent to the Albuquerque Isotopes where he is (was?) a coach. See, never give up hope. This 1964 Topps Ken McBride was part of an SCN trade I made recently with Adam. 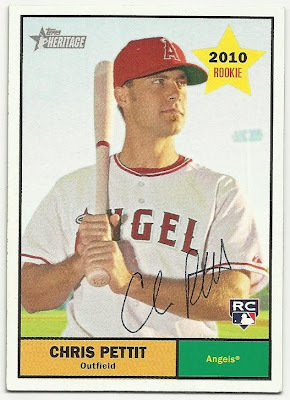 Another Spring Training success was this 2010 Topps Heritage signed by Chris Pettit. Chris signed this in 31 days c/o the Dodgers Spring Training. 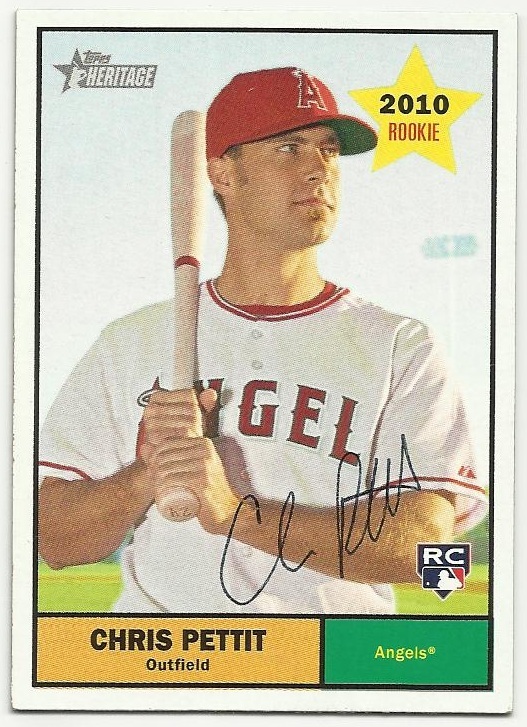 Chris signed as a free agent with the Dodgers in January. I hope he does well with them. The second part of the SCN trade with Adam was this 1968 Topps Bobby Knoop. Gotta love how the older guys prefer ballpoint over sharpie. If you're an SCN member, then you know all about Tracy Jones' offer to send a signed card to anyone who sent him an email asking for one. Back in December I sent the email, and last week I finally got my signed card. It came in a plain white envelope with no return address. Thanks Tracy! 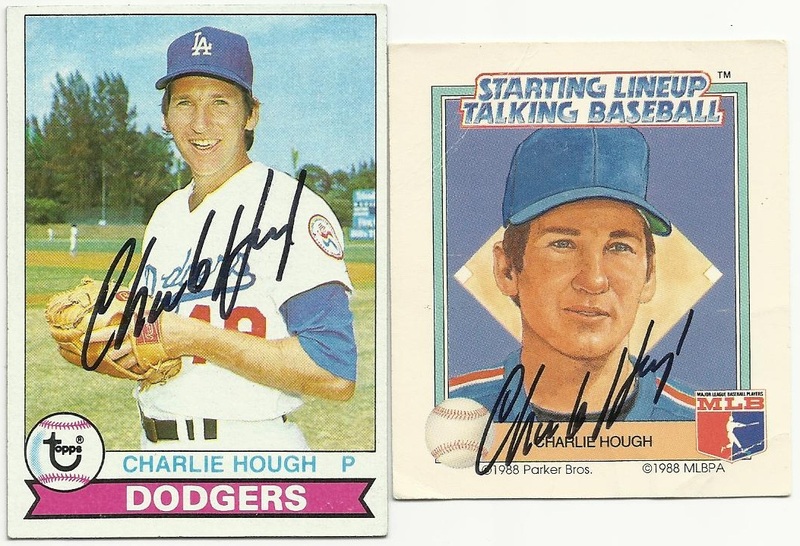 Charlie Hough has always been a good TTMer and again he didn't disappoint. 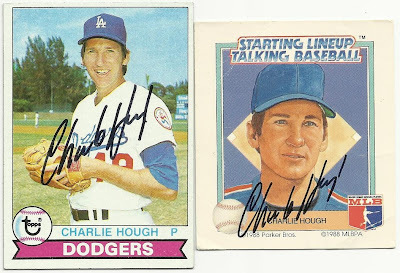 Charlie signed my 1979 Topps and 1988 Starting Lineup Talking Baseball card in 96 days from his home in Brea. I expressed a trade interest in this 1965 Steve Boros card from SCN member Joel. 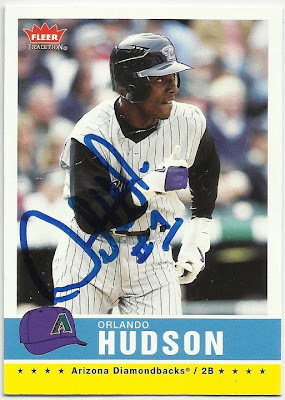 Joel saw a signed Ron Washington card I had for trade so we agreed to the deal. 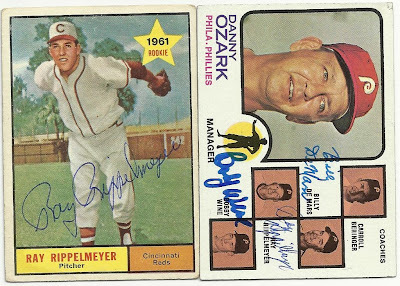 I dig the 1965 Topps design and have been slowly accumulating and getting these signed. 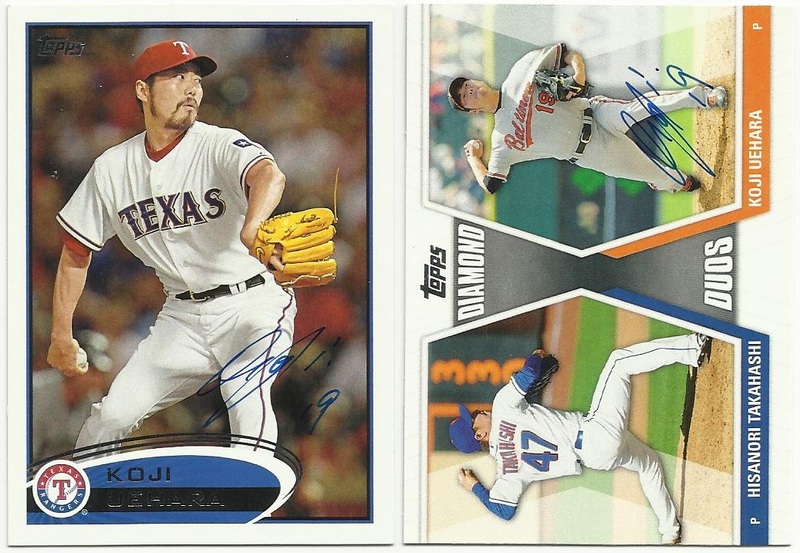 I sent these cards to Koji Uehara at the Rangers ST primarily to get the Diamond Duo card signed by both guys. 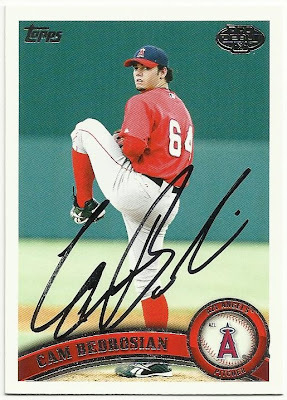 Takahashi plays for the Angels so it will go to him next. It's probably too late to send to ST now though. 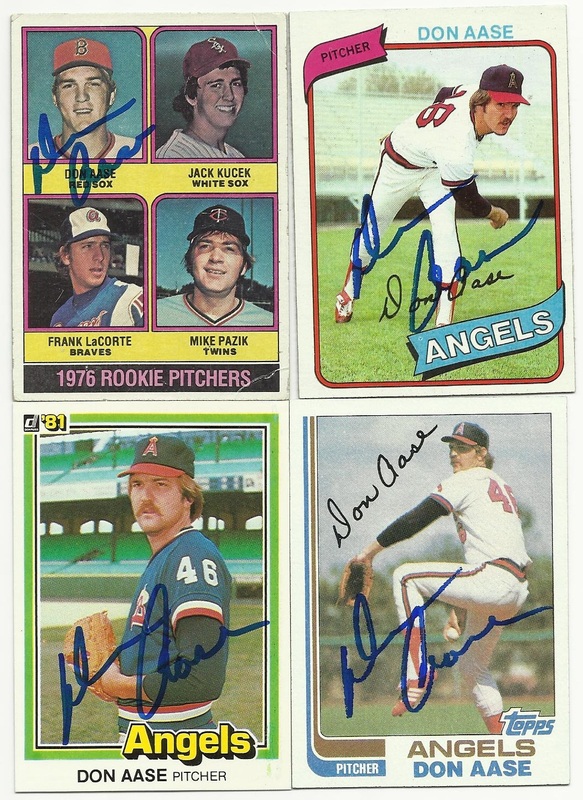 Angels great Don Aase signed this 1976, 1980, and 1982 Topps cards and included the 1981 Donruss. 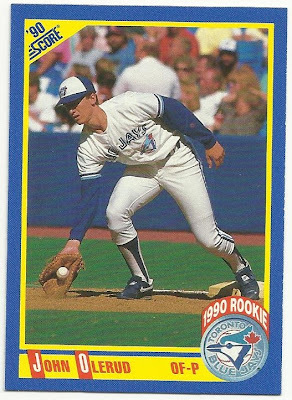 I'd been sitting on the rookie card for a while and finally decided to send it out. Glad I did because 69 days later I got them back with a bonus! 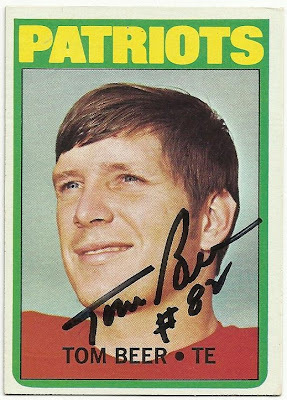 Patriot Tom Beer signed my 1972 Topps and a custom IC, and answered a couple questions in 24 days from his home in New Jersey. 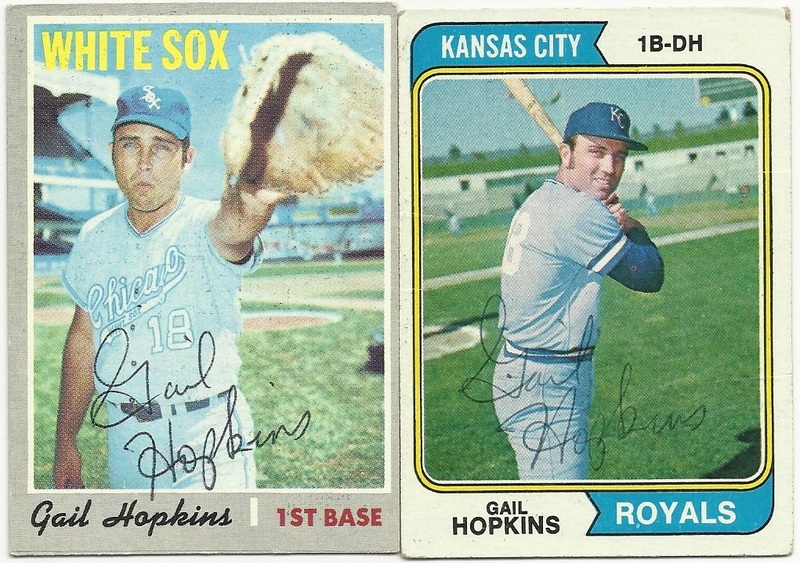 Only 8 days in the mail brought me this 1970 and 1974 Topps cards of Gail Hopkins. Gail also answered my questions. Dr. Hopkins became an MD after baseball. 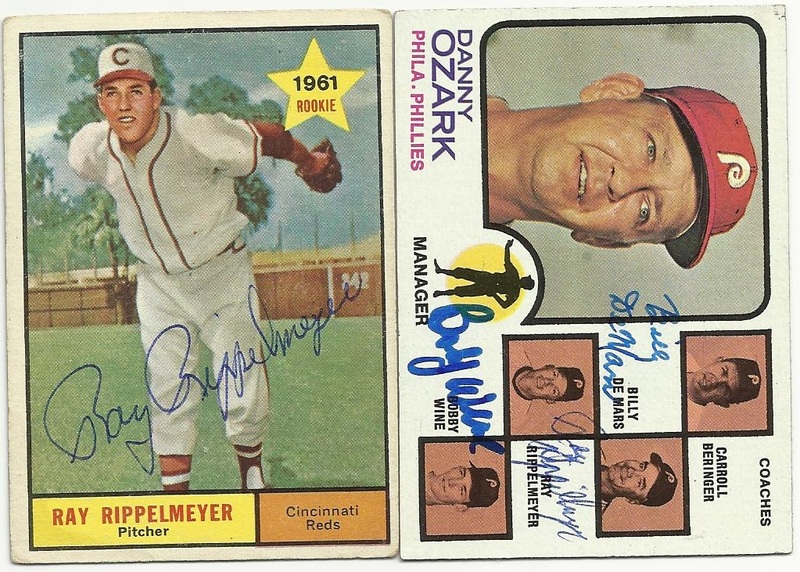 Ray Ripplemeyer ballpointed my cards in 8 days from his home. 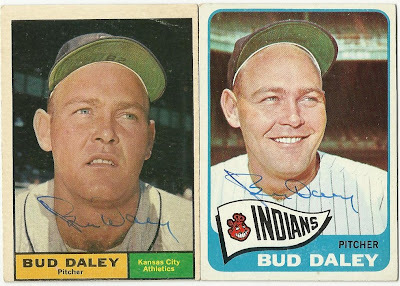 That 1961 Topps is a pretty cool looking card. I picked up this 1960 Topps Gary Glick card at LCS a while ago from the quarter bin. I saw on SCN he was a good TTMer so I sent it to him. He not only signed it but included the card on the right. He also answered my questions and included two more signed postcard-sized cards. Super nice guy. Phew! Well that's it. I'm now caught up on my TTM autographs. Until tomorrows mail, I hope! Topps Birthday Cards For Me!